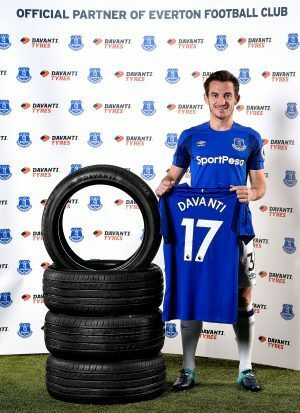 Everton FC has agreed a new partnership with Davanti Tyres. The brand will become Everton's official tyre partner as part of a three-year deal with the club. Senior representatives from Davanti Tyres were joined by Everton’s Leighton Baines to launch the deal at Goodison Park. Alan McTavish, Everton's head of commercial, said: "Everyone at the club is looking forward to collaborating with Davanti, both here in the UK and globally in their key markets. Through a strategic and creative activation programme, we can really bring this partnership to life." Peter Cross, general manager from Davanti Tyres, added: "We are delighted to have agreed this long term global partnership with Everton Football Club. The ambition of the club strikes a real chord with us as we too are extremely ambitious for the growth of our brand." Yesterday we reported that Everton's first game to be streamed on Facebook Live was watched by more than 1.5 million fans.